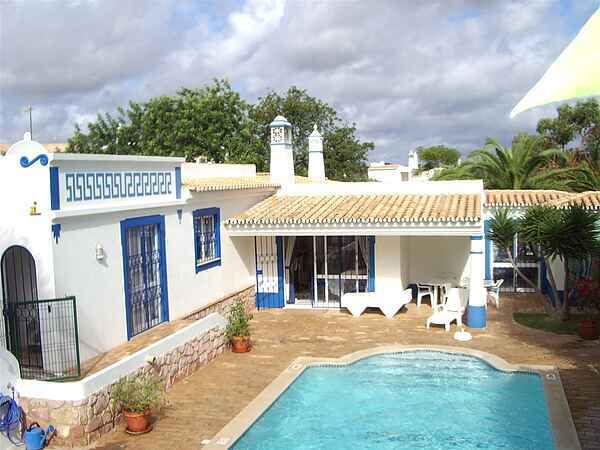 Casa Romantica has 3 bedrooms - a double bedroom with en-suite bathroom, which has patio doors out onto the pool. There are also 2 twin bedrooms. There is also a large double sofa bed in the lounge. All the bedrooms have air conditioning, built-in wardrobes and mosquito nets on all the windows. Baby cots and additional single beds are provided free of charge. There is an en-suite bathroom with a shower attached to the master bedroom. There is family bathroom with a shower. Both these bathrooms have twin sinks. There is also a separate shower room and a shower by the pool. The kitchen is fully fitted with all modern appliances and a built-in marble dining table. Large fridge/freezer, cooker, washing machine, dishwasher, microwave, toaster, hairdryer, iron and ironing board. The kitchen also has air-conditioning. The dining room has a large dining table, which seats up to 8 people. The living and dining room have air-conditioning and a wood-burning stove for winter use and patio doors leading out onto a large terrace with sun loungers and umbrellas by the pool. A 25% deposit is paid when making the booking and the balance is paid 10 weeks before your holiday dates. Pool heating is optional and costs 200 euros per week. A 250 euro refundable security deposit is payable with the balance payment and refunded 2 weeks after your holiday. Our management company offices are only 0.5 km from the villa. They offer friendly advice, help and assistance to all our guests including a welcome visit to introduce you to the villa and surrounding area. They also sell tickets to waterparks, the zoomarine, horse riding, golf, boat, fishing trips and excursions at discount prices. Excursions to the local markets and other places of interest in the Algarve are also available. We definitely recommend a day out to Seville and Lisbon, which are fantastic cities. You can buy tickets to most of the above plus much more with a 10% discount from our local Management Office. Local attractions include Water Slide Parks, Zoomarine (Aquarium/Seals/Dolphins), Krazy World (mini golf, reptile and animal parks), Zoo - Barão São João (Tropical birds, monkeys, domestic animals), Water skiing, Surfing, Swimming, Scuba Diving, Jet skiing, Snorkeling, Sailing, Yachting, Golf, Tennis, Water Park. In the main summer months many beaches operate children clubs. The beaches of Gale (Praia da Gale) and Castello are a 10-minute drive away.